Ever since I blogged about this incident I am facing with Proton Edar, quite a number of friends contacted me to relate their own 'ugly' experience when dealing with Proton Edar's warranty and after sales service. Such a shame...thought I am an isolated case...but AM NOT. Most suggested that I go to the media..that's how they solved their's. For the passed few days, I had continuously tried to call Proton Edar's Mutiara Service Centre. Same scenario, no change. Then on one occasion, a ray of hope...the receptionist gave the person in charge's mobile number. With full enthusiasm, I called. It was off...and I was disappointed. From: "I.CARE CENTRE PROTON EDAR"
We would like to apologize for all the inconvenience you have been experiencing. We will look into your concerns immediately and will investigate with the said service ctr. Today I got a call from Proton Mutiara Service Centre. No apologizes, nothing..the lady only said the parts are here and I could come in to have them replaced. Pissed off, I asked her why the delay. "Oh barang tu ada, dia orang lupa call" (oh the parts are here, they forgot to call you). From 8th March until today, 31st May, nearly 3 months (short of 9 days), I finally got a positive answer from Proton Edar. Knowing Proton Edar, I would continue to keep my fingers crossed until I see those parts physically fitted on my car. I thought when I got my new Persona SE a few months back, my bad experience with Proton Edar would be over... (read here). However I was wrong. My latest experience with Proton Edar Service Centre really pisses me off, and puts to shame the higher powers of Proton Edar...and mind you not just any Service Centre...its Proton Edar's flagship Mutiara Service Centre. 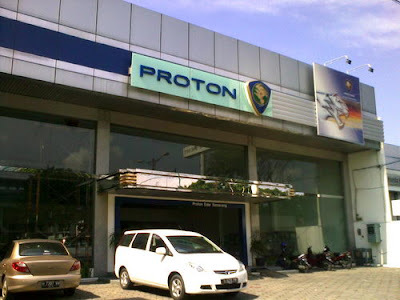 I had chosen that Service Centre for 2 reasons, 1) its Proton Edar's flagship centre, so I assumed their service level is at their best level 2) coz its nearest to my office. I had for the last 2 weeks tried to enquire the status of those parts but without any success. Its either I get through to the reception/help desk who then passes me to the relevant department but NO ONE answers OR lately I cant even get through the reception/help desk at all as no one seems to be picking up the phone. The number I called is the one stated on the invoice 03-77223221. I had the same problem on my previous warranty claim for an orifice that was out of stock. After 1 month plus of waiting I called them and asked why no one has called me. They said there's no stock. But the next day, someone calls me up to say otherwise. If the parts are not related to the safety of my car and its occupants, I would not have made a fuss, but these parts are related to the brake and absorber system that affects the stability and safety. Its almost 2 months, and I cant believe that these parts aren't available yet. Please kindly be advised that we have received a customer complaint as regard after sales service support from Mutiara Damansara Service Branch. We are concerned on the feed backs as reported and would seek your immediate attention to matter. After all these (please read the following emails I had forwarded to you), NO ONE from Proton Edar contacted me to solve my problem. I tried calling Mutiara a few times, but still facing the same problem. So if your people at Customer Retention, at Quality Dept didn't do anything to help me, what more those guys at the Service Centre? WHO DO I HAVE TO CALL to get this done? Your CEO? Then please do me a favour and FORWARD MY EMAIL TO HIM. The thing I couldn't understand is, brake system and absorber system affects the stability of a car. The thing that pisses me off is I carry my family members, i.e. my parents, wife and kids, in that car. When I am called for a rescue operation, that is the car I drive quite fast to get to the scene a.s.a.p. I spend lots of money to send my car for routine maintenance at authorised Proton Edar Service Centre just to ensure the warranty is not affected. Everyone knows how ridiculously high the charges are at these centres. After all that, Proton Edar can't even find me a pair of absorbers, brake discs and brake pads? Heck, I could get those at the corner auto spare parts shop. Proton Edar, of all people, should be sensitive to the safety of its customers as well as their families. This is typical Malaysia attitude, the lives of the common people means nothing to these big corporations. Its the same as what I had blogged before, why export models have a higher safety fittings and workmanship than local models? You guys are too focused on sales figures, that you overlook on the importance of after sales service. Listen here you morons...people only go to your service centres because you would void their warranties otherwise. But what's the point of sending if you DO NOT HONOUR your warranty? MONTHS just to get the basic parts? Even a small kid would know that having a functional brake and absorber system is the core of a vehicle's stability and safety. As a former Head of Quality Assurance & Management for a large Telecommunication corporation, this is no way acceptable by any one's standard. Its a wonder why major NCRs not issued out during your quality audits coz there is evidence to show that customer complains do not get attended to by anyone. About 6 months back, a few family members and I pooled our resources and invested in an Arowana breeding program. The program was run by a very successful Arowana Fish Farm in Bukit Merah. The species that we chose was the Malaysian Golden Crossback Arowana. This species is very high in demand and unique only to Bukit Merah lake area.